Fade in to the interior of a small apartment in the center of a rain-soaked Scottish city. The drizzle smears the outside of the windows, lending a melancholy to the scene that is enhanced by a knowledge that the rest of the world is enjoying the full heat of the summer sun. The floorboards gleam from being recently swept; a vase of fresh flowers adorns the dining table, which tonight has been given a break from its usual food-bearing responsibilities. A wide pan of the living room reveals freshly plumped pillows on the sofa and cocktail bowls half-full of nondescript nibbles laid out on the coffee table. Strains of vocal music in another language gently permeate the background, the resulting compromise of an unseen conversation involving many protestations of the ‘no, not that album again!’ variety. Our hosts, a tall blond man and a dark-haired woman, the latter having just changed her shirt to escape an unsightly red berry stain, are aimlessly pacing between the kitchen and living room, obviously nervous for reasons yet unknown. Suddenly the telephone rings, shattering the moody tension like a wrecking ball against an abandoned tenement. The hosts look at each other, neither making a move to answer it. Instead the woman spins and heads for the door as if on cue, already planning an apology for the fact that the bell is still broken, but secretly relieved that she remembered to tell the mysterious visitors to phone when they arrived. She sprints down a narrow staircase to the entry at ground level and hurriedly welcomes two people in the door, the newcomers slightly damp from the drizzle, both looking every bit as bewildered and nervous as our hosts a moment ago. The guests, one man and one woman, approximately the same age as our hosts and both of them bearing strikingly good looks, are ushered into the apartment and relieved of their rain protection. Introductions are passed around like business cards and a bottle of wine is exchanged. These people are all obviously strangers, but the reason for their rendezvous tonight is as of yet still unknown. Our hostess insists on leading the newcomers on a tour of the apartment, which due to its size takes less than a minute, before ushering them into the living room and offering them a drink. The guests accept enthusiastically and ponder the choices on offer: strawberry, raspberry, mango or passionfruit? They decide, and our hostess disappears for a moment into the kitchen. She returns bearing glasses of festive multicolored liquid to find the conversation already in full swing. Like a friendly game of ping-pong, questions are enthusiastically being served up and the answers swatted back. The two parties speak of travel, and of work, and of homes in faraway places. There are numerous indecipherable references to something called ‘the blog‘, which apparently has something to do with food – perhaps it’s a restaurant, a hot new ethnic ingredient, or maybe even a cutting-edge preparation along the lines of nitro-foaming? This seems to be the key to the mystery of their acquaintance, however, as both female participants in this drama appear to be deeply knowledgeable about the topic. After a drawn-out montage of colored liquid levels dropping in the glasses, we return to a shot of the characters still talking animatedly, punctuating their stories with enthusiastic hand-gestures and peals of laughter. There is a palpable change of mood in the air; everyone’s rigid postures have relaxed, the formal undertones of speech have faded, and if it weren’t for the introductions we could even assume the entire group had been extremely good friends for years. Suddenly our hostess glances at her watch and catches her breath. "We must go!" she announces with alarm. Everyone checks their own watches and agrees. There is a bustle of activity as last sips of drink are drained and coats are gathered. There is more talk of food, this time in hopeful, anticipatory tones, in the background we distinctly hear the growl of someone’s stomach. Everyone is smiling giddily, a tangible sense of excitement resonating through the room as everyone eagerly crowds toward the door. Our hostess, the last one to exit, after remembering to switch off the entry light, shuts the door behind her, throwing the scene into darkness, the sound of laughter trailing off and fading into the stairwell beyond. Suddenly the front door swings open again and our hosts stumble in, clutching their bellies. Their clothes exude the absorbed smells of garlic, whiskey and fine cigar smoke, and one of them has acquired a new, spicy-smelling red stain on her shirt. They are smiling, satisfied. The host collapses on the bed in a dreamy stupor, muttering incoherently about chocolate mousse. Our hostess heads for the living room to clear away the used glasses and bowls, and then returns to the bedroom, pausing along the way to wipe off her mascara at the bathroom mirror. As she does so she calls out to the host, who unbeknownst to her has just fallen fast asleep at the foot of the bed in a rather awkward position. She doesn’t mind that she gets no response, however, because what she says is as much for herself as for him. "Food bloggers are such nice people. And to think I used to assume that everyone you met through the internet had to be some kind of weirdo…"
I served these variations on the classic Bellini cocktail to the lovely Michele and her boyfriend G., who were visiting from Germany and came to our place for pre-dinner drinks on Wednesday. I am almost embarrassed to call this a recipe, since it’s so simple, but I thought this was an exotic and fun variation on the classic peach-and-prosecco cocktail. Feel free to substitute any other fruits you like. Cut the passionfruit in half, scrape out the seeds and pulp and rub through a sieve into a bowl until you’ve extracted most of the liquid. Discard the seeds. Prepare everything else by pureeing it separately (my immersion blender worked particularly well for this), and passing it through a sieve to remove seeds and fibers. Add a few tablespoons of sugar to each of the fruit purees (they should be quite sweet – like a dessert coulis) and a few drops of lemon juice if they need some acidity. Chill until needed. 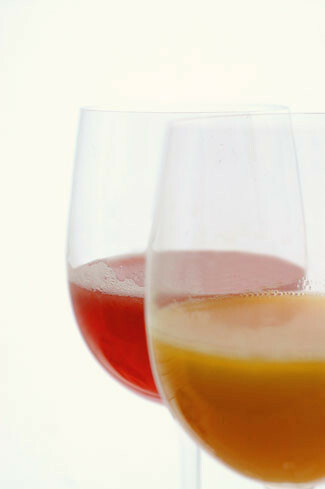 Put 2-3 tablespoons of fruit puree (mixed flavors or just one) in a champagne flute and top up with the prosecco. Give it a quick stir and serve. I was lucky enough to meet two food bloggers on separate occasions this week. Haddock, the chef, from Knives Edge, followed by the Restaurant Whore. I can’t believe how well i got on well with both of them. It is kind of weird meeting people via the net, but in food blog land it just seems so natural somehow. Add another cheers to the list – I really enjoyed reading this post. I had to cover up the bottom of the entry to keep myself from ruining the suspense! Fantastic post. Maybe you and the hubby should pack up your bags and do a world tour, calling on all those strange people you’ve met on the Internet. And, of course, you can expect Bellinis with whatever local fruit is in season upon arrival. Oh! The drama, the intrigue … the bellinis! It sounds like quite the meeting. I adored this post! Actually, most of the fruit at the local “wet market” that I’ve been buying is imported…white peaches, mangos, etc. How about a soursop margarita instead? Bellinis??? Stop it I say! You’re putting thoughts into my head. Just as well, I couldn’t find my favorite margarita mix anywhere around here and needed something else… that photo does it for me!